We were commissioned to design, build and install a home entertainment and integrated security system for a discerning London property developer. This multi-room television package included the latest Pioneer HDTV Plasma wide screen along with multiple speakers throughout the home. A ‘wet’ screen was specified for relaxing in the bathroom. Each TV can be tuned independently into whichever channel the viewer chooses. We installed the latest colour video door entry system at various locations within the property. For extra security, this also controls the door locks, accesses the external CCTV and allows for the recording of images if required. 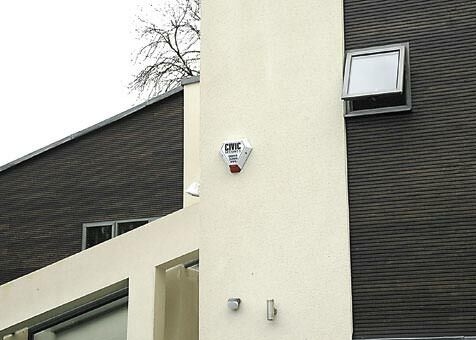 We installed a remotely monitored alarm system in conjunction with Civic Security. If activated, signals are sent to a monitoring centre to contact the police in the event of a confirmed signal. For extra security in the event of a power failure, self-contained emergency luminaries were installed both inside and out. We fitted CCTV with recording via a Digital Video Recorder that can be accessed via the internal door entry system and remotely from anywhere in the world. The automated gates provide powerful long-term performance and reliability with the highest levels of safety and security. A gate entry audio/video system completes this first line of security.